Get free gifts by ordering the book now! Click here for more details. I encourage you to start living YOUR dream life today. It is easy to get caught up in what other people want for us, or to continue playing out that same role we gew up with in our own family, school, or environment, instead of being who we really want to be. Sometimes, we want to have a certain title, accomplishment or thing, and when we get it, we wonder...is this "it"? What really fulfills us? 10 steps that you can start taking today to feel your best, be you and live your dream life, regardless of what is going on around you. Let's get started right now - don't postpone feeling great another second. Go on - you deserve it! Let yourself shine! CLICK HERE to win a FREE autographed copy of the book! 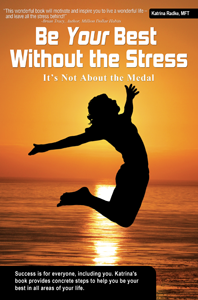 "This wonderful book will motivate and inspire you to live a wonderful life - and leave all the stress behind!" “When you continually focus on being your best no matter what the event, you surprise yourself with what is possible. Katrina’s enlightening stories and simple tools help you to discover new depths within yourself."